Sometimes it may seem like tea is an overarching drink that’s pretty much the same no matter what. But much like there are dark and lights roasts of coffee, there are also various blends of tea! There are caffeinated and decaffeinated blends of tea, too, making them great for waking up in the morning and for relaxing before you go to sleep. 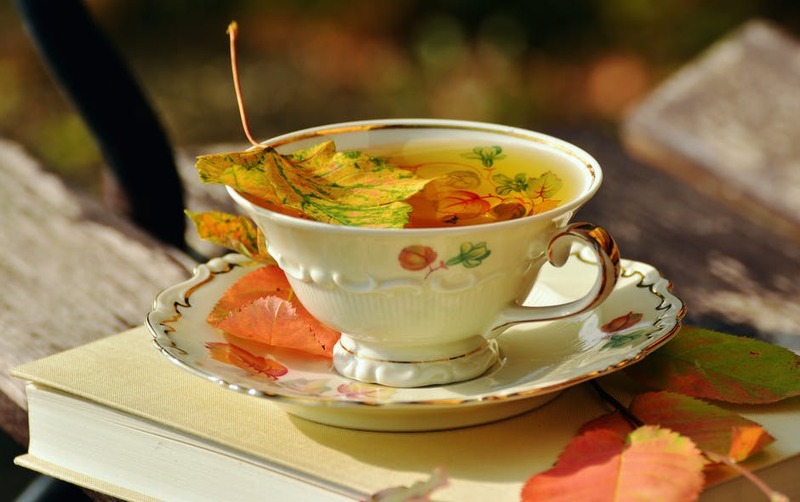 One of the most popular tea blends is herbal tea. In this concise but informative cheat sheet, learn what goes into an herbal blend, the best way to steep your tea, and the health benefits. Herbal tea is made of herbs (surprise, surprise! ), spices, fruits, and other plant materials. Another form of herbal tea is fruit tea, which is made of plant materials and fruits. An important distinction between herbal teas and “true” teas (such as green and black tea blends) is that the former are made of tisanes while “true” teas are made from the Camelia Sinensis plant . The Camelia Sinensis plant can be processed in a variety of ways to create different types of tea, such as Earl Grey and English Breakfast and even green tea. Tisanes come in many different forms, such as leaf, flower, fruit, spice, and root tisanes. Some examples of these are hibiscus, lavender, mint, and ginger. One of the best benefits of herbal tea is that it doesn’t contain any caffeine. Some of you may be thinking, why is that a good thing? Well, a lot of people want something that’s going to relax them before going to sleep. And if you’re one of those people, consider drinking a cup of Dollar Tea Club’s herbal Sweet Dreams before heading to bed. Teas that go herbal are known for their medicinal properties, particularly in their ingredients. 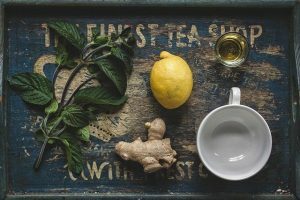 Ingredients like ginger, peppermint, and dandelion have science-backed benefits like aiding digestive issues, relieving abdominal gas, and dealing with liver issues respectively. Herbal rooibos tea also improves vascular health and lower cholesterol, especially those brewed from South Africa (that’s where all our rooibos is sourced from). These teas also contain distinct botanicals whose benefits we’ve discussed before. Herbal tea has been said to help when you have a cold because it can act as a natural decongestant. It has also been said to help provide relief from nausea, which can be extremely useful for pregnant women. 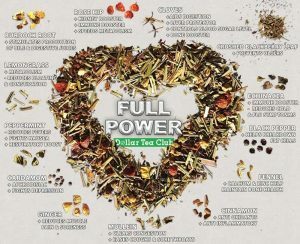 Simply drink a cup of herbal tea, such as Full Power, and you should feel better soon afterward! Another reason to brew a cup of herbal tea is that it can improve your digestion and act as an anti-inflammatory agent. Whether you have a stomach ache or a rheumatic ache, a cup of tea is a suitable drink you need to feel better. What’s the best way to brew herbal tea? Herbal tea can be a bit trickier to brew, because it’s created using all-natural plant materials and herbs rather than the Camelia Sinensis plant. But that doesn’t mean it’s not easy! The perfect cup of herbal tea can be brewed in four steps. First, measure out your premium loose-leaf herbal tea. You’ll need about 1-2 teaspoons for every 6-8 ounces of water. Next, place your loose-leaf tea into a tea infuser or a tea bag so it’s ready to be brewed! Third is simple: steep the tea! You’ll want to steep your tea for 4 to 6 minutes in 100-degree Celsius water (212 degrees Fahrenheit). Be careful not to steep for too long because the longer your steep herbal tea, the more bitter the flavor becomes. The final step is additives, which is completely optional but a great way to add flavor! Some classic additives are milk, honey, sugar, and lemon juice! You can also opt for a vegan option by using cane sugar or agave syrup. For a more detailed guide to brewing the perfect herbal cup of tea, see our previous blog post here! We hope that you enjoy herbal tea as much as we do. If you’ve never tried it, that you feel inspired to do so. A great way to try out tons of loose-leaf, herbal tea and other tea blends is a subscription box from Dollar Tea Club – starting at only $1 per month! This entry was posted in Did you know?, Story Time and tagged cheat sheet, did you know, dollar tea club, herbal tea, loose leaf tea, natural tea, organic tea, subscription box, tea, tea 101, tea essentials, tea tips, teas, tips.